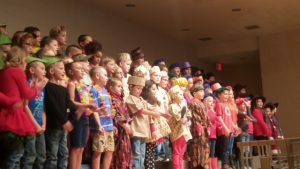 On Tuesday, December 5, 2017, our first graders took us on a world tour to discover how other countries celebrate the holiday season. “It’s Christmas Everywhere,” took us to Germany, Australia, Canadian French provinces, South Africa, and The Catelonia region of Spain.Our students gained curriculum connections between the music, history, customs, and culture of each area. Singing in different languages and learning their holiday greetings was a favorite among our students. Although Christmas is celebrated different ways in different places, and the greetings are unique in each land,we each share a lot this time of year: traditions, generosity, music, love for family and friends, doing for others. We hope you and yours have a safe and joyous holiday season.